Green Hope is a youth led organisation which seeks to provide a networking platform for young people to carry forward the Rio+20 legacy of sustainable development. It was founded in 2012 by Kehkashan Basu when she was 12 years old on her return from Rio de Janeiro, Brazil. After speaking at the Earth Summit she realised that children like her needed more opportunities of engagement and empowerment. She, along with her core team of like-minded young people, engage the community through various environmental outreach programmes and ground level projects focusing on biodiversity conservation, climate change, alternate energy usage, future justice , sustainable consumption, gender equality, social upliftment, waste segregation and reversing land degradation. Green Hope regularly conducts “Environment Academies”, which are unique workshops for school/ university students and corporates to spread awareness about the environment and sustainability. Kehkashan personally trains members of her organisation to make presentations at these academies – this is a unique initiative as its run entirely by young people. By the end of 2014 Green Hope had reached out to over 100 institutions and 3,000 students through these academies. Green Hope has been accorded partner status by the Knowledge and Human Development Authority (KHDA), which is the governing body for education in Dubai . In September 2014 UN Women invited Kehkashan to speak about the Green Hope initiative at the Leaders Forum on Climate Change in New York. Green Hope works closely with Dubai Electricity and Water Authority and Dubai Municipality, who awarded them with the “First Ambassador of Sustainability 2014” award for their work on waste recycling. Green Hope is reaching out to the international fraternity through partnerships with organisations across several countries and has grown to 800+ members globally. It has conducted events and workshops in the USA, Canada, India, Brazil, Kenya and Sri Lanka. 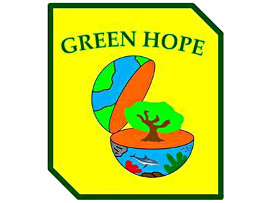 Read more about Green Hope on their website and Facebook page.